oh my son loves monster trucks!!! Grave digger crushing cars is always the best!!!! thank you so much for this chance he would be so excited to go! thank you! Another awesome giveaway! Oh I would love your contact... we attend every year and love it! HUGE FANS! my son likes to see the trucks flying in the air. My son's favourite is Grave Digger. So much fun! my kids favourite Monster Truck trick is flipping over and crushing cars. my boys love them driving over the cars, crushing them! I noticed at Ticket Master that it's at the Rogers center Jan 19&20. We love when they crush the cars! It's all about the CRUSH. My kids favorite would be the crushing cars ! My little guy loves the flying through the air and flipping over lol! Grinder is one of my BF's son's faves. He likes ALL Monster Trucks though. Santa could just bring him everything Monster Truck related and he would be sooo happy. His favourite "trick" would have to be when the trucks lose a wheel or break something. He's all about destruction, lol. Didn't even know they were coming to TO! Great contest. Gotta love the cyclone donut. 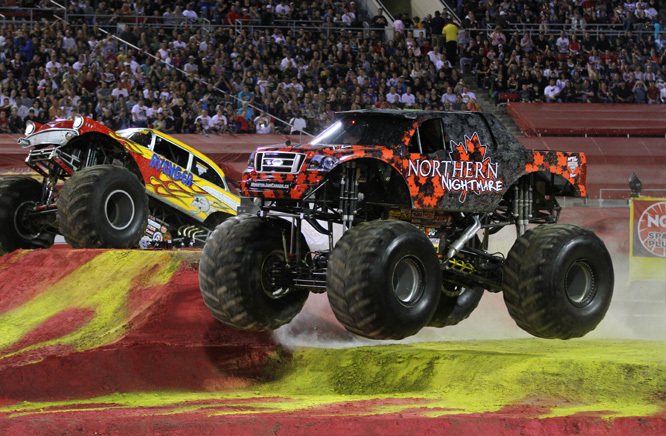 My Son's favorite Monster Truck trick would definitely be flying through the air!! My Son loves Monster trucks!!! Evan says "when the trucks fly and the CRASH"!!! My son loves when they fly through the air! My son loves Grave Digger (has a few toy trucks of his own) and of course loves it when it CRUSHES the other cars. Thanks for the opportunity..
My son loves Grave Digger (and owns a few toy trucks of Grave Digger) and of course loves when it CRUSHES other cars. Thanks for the opportunity. grave digger! our neighbour had a power wheels one and our kids loved it! My son loves the cars crush and the flying through the air tricks. we love the trucks flying thtough the air !!! As a FYI, my friend told me the advantages to going to the Sunday show. On Saturday, the Trucks don't go ALL OUT since they don't want to damage the trucks for Sunday, and they try to preserve the track. On Sunday, they go ALL OUT since it's the last day. They will attempt more crowd pleasing stunts. Heard that it's good to get a Pit Pass so you can see the trucks really good. Never been before, and son's been bugging me, so have my fingers crossed. sajak551, thanks for posting the great tip! I saw footage of the show, and at one point the truck burst into flames due to too much stress! I had thought that it was planned, but I guess you just never know! My daughter Daniella LOVES MM Dalmation. She says she loves all the tricks like the doughnuts, flying and flips and that he is "Spot-tastic"
My kids love the Monster trucks. They love that they can crush cars and fly through the air, but in honestly, I think the thing they love the most is the sheer size of them!